I am a School of Natural Sciences Dean’s Distinguished Fellow at University of California, Merced , USA. My Ph.D. adviser is Prof. Roummel F. Marcia. I obtained two bachelor of science degrees from Sri Lanka in 2008 and 2010, and worked as a university instructor for two years before starting my doctoral studies at UC Merced in Fall 2012. In summer 2016, I worked on a bathymetry estimation group project under the guidance of the US army corps of engineers at Statistical and Applied Mathematical Sciences Institute (SAMSI), NCSU, NC. My research interests: Nonconvex optimization, sparse signal/image recovery, large-scale numerical optimization, machine learning and medical imaging. About thirty students selected from a national pool work in teams on projects presented by nonacademic scientists. The workshop exposes mathematics and statistics students to current research problems from government labs and industry as well as to a team approach to problem solving. The students learn to interact with scientists outside their discipline, allocate tasks among team members, and communicate results through both oral presentations and written reports. 2016 research reports inlucding my group report (using remote sensing for bathymetry estimation in coastal environments) can be found here . Underwent a one-month industrial training at Ansell Lanka (Pvt) Ltd., Sri Lanka, where I performed a defect analysis to improve the quality of their glove manufacturing process. The major objectives of this project were to: (1) Identify the major defects of Professional Health Care (PHC) gloves, (2) Determine the process average and average outgoing quality of PHC gloves over the time, (3) Analyze the relationships between major defect types, (4) Give an opportunity to make corrective decisions to improve the process quality, (5) Identify the variation of FIFO (First In First Out) failed lots, missing lots in dipping and packing sections over the time. At the end of this project, management of the Ansell Lanka (Pvt) Ltd. was able to make corrective decisions regarding the quality of the PHC gloves. Results of this study revealed the major defects and their relationships of the PHC gloves. Furthermore, we realized which defect types should reduce to improve the process quality efficiently. Also, the results of this analysis were used to show the quality performance to the Quality Assurance Review Board. The	Applied Mathematics Research	Travel	Fellowship	provides	support	to	outstanding continuing	doctoral	students	in	the Applied Mathematics	Graduate	Program at UC Merced in	order	to	facilitate	the	dissemination	of research	results needed	to	complete	a	high	quality	Ph.D.	dissertation. The award	is	intended	to	enable students	to	travel	to	a	scientific	meeting. Get more details from SIAM conference on optimization. Get more details from School of Natural Sciences, UC Merced. See more details at ODSC-West. 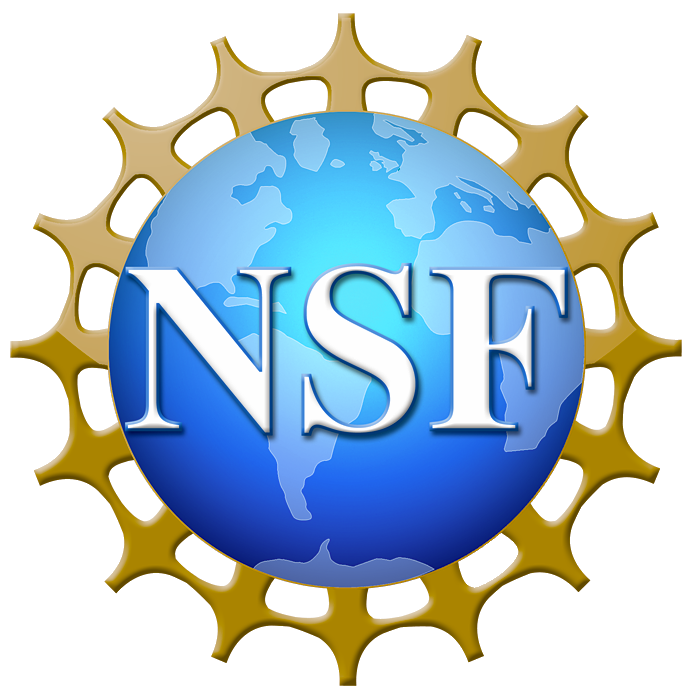 GlobalSIP 2016 grants are funded by the US National Science Foundation and fellowships are awarded based on the paper quality. The Graduate Student Opportunity Program (GSOP) forms an important link in the continuum of support for academically promising graduate students at UC Merced. This award assists recipients in acquiring and developing advanced research skills that will result in a significant achievement for the student. It is designed to improve mentoring for UC Merced (UCM) doctoral students who will not be at the dissertation stage during the award period, but who are currently engaged in research with a faculty mentor. The award is expected to increase the number of graduate students who complete their Ph.D. degree and successfully acquire a faculty appointment. The	Applied	Mathematics Summer Research	Travel	Fellowship	provides	support	to	outstanding continuing	doctoral	students	in	the Applied Mathematics	Graduate	Program at UC Merced in	order	to	facilitate	the	dissemination	of research	results needed	to	complete	a	high	quality	Ph.D.	dissertation. The award	is	intended	to	enable students	to	travel	to	a	scientific	meeting. Grade 5 Scholarship with a Cash Prize. You can find my publications below. Source codes to solve some research problems are also available to download along with the manuscript. Peer-Reviewed PaperProceedings of M.Sc./Ph.D. Forum in the 2017 IEEE International Conference on Acoustics, Speech and Signal Processing, 2017. While convex optimization for low-light imaging has received some attention by the imaging community, non-convex optimization techniques for photon-limited imaging are still in their nascent stages. In this thesis, we developed a stage-based non-convex approach to recover high-resolution sparse signals from low-dimensional measurements corrupted by Poisson noise. We incorporate gradient-based information to construct a sequence of quadratic subproblems with an -norm (0 p 1) penalty term to promote sparsity. The proposed methods lead to more accurate and high strength reconstructions in medical imaging applications such as bioluminescence tomography and fluorescence lifetime imaging. Accurate reconstruction of high-dimensional sparse signals from low-dimensional low-count photon observations is a challenging nonlinear optimization problem. Recent work in nonconvex optimization has shown that sparse signals can be recovered accurately by minimizing the p-norm (0 p 1) regularized negative Poisson log-likelihood function. In this paper, we propose to regularize the negative Poisson log-likelihood by the generalized nonconvex Shannon entropy function. Moreover, the non-separable Shannon regularization function is approximated using its first-order Taylor series at each iteration. We explore the effectiveness and efficiency of the proposed approach using numerical experiments. Peer-Reviewed Paper Proceedings of 2017 IEEE 5th Portuguese Meeting on Bioengineering, 2017. Structural variations (SVs) - genomic rearrangements such as insertions, deletions and duplications - represent an important class of genomic variation. These mutations have been associated with both genetic diseases (e.g., cancer) and promoting genetic diversity. The common approach to detecting SVs in an unknown genome involves sequencing fragments of the genome, comparing them to a reference genome, and predicting SVs based on identified discordant fragments. However, detecting SVs from traditional DNA sequencing is challenging due to the presence of errors and biases in the DNA sequencing process as well as problems aligning sequences to a reference genome. The majority of existing methods use hierarchical relationships to detect these genetic changes, but often post-process this information. Our work aims to improve on existing SV detection methods in three ways: First, we use a continuous relaxation of admissible solutions to apply gradient-based optimization techniques. Second, since SVs are rare, we incorporate an sparsity-promoting penalty term. Third, we improve on our previous work by using a blockcoordinate descent approach to predict variants in families of individuals. We demonstrate the effectiveness of our method on a variety of simulated datasets and real genomes of a two parenttwo child family. This work addresses the recovery and demixing problem of signals that are sparse in some general dictionary. Involved applications include source separation, image inpainting, super-resolution, and restoration of signals corrupted by clipping, saturation, impulsive noise, or narrowband interference. We employ the -norm for sparsity inducing and propose a constrained -minimization formulation for the recovery and demixing problem. This nonconvex formulation is approximately solved by two efficient first-order algorithms based on proximal coordinate descent and alternative direction method of multipliers (ADMM), respectively. The new algorithms are convergent in the nonconvex case and scale well for high-dimensional problems. A convergence condition of the new ADMM algorithm has been derived. Furthermore, extension of the two algorithms for multi-channels joint recovery has been presented, which can further exploit the joint sparsity pattern among multi-channel signals. Numerical experiments on inpainting showed that the new algorithms can achieve considerable performance gain over the -minimization algorithms (an improvement of more than 8dB in terms of peak-signal noise ratio). Peer-Reviewed Paper Proceedings of 2016 IEEE Global Conference on Signal and Information Processing, 2016. We present a novel, three-stage method to solve the fluorescence lifetime imaging problem under low-photon conditions. In particular, we reconstruct the fluorophore concentration along with its support and fluorescence lifetime from the time-dependent measurements of scattered light exiting the domain. Because detectors used for these problems are photon counting devices, measurements are corrupted by Poisson noise. Consequently, we explicitly consider Poisson noise in conjunction with SPIRAL- a sparsity-promoting nonconvex optimization method to solve this problem. We demonstrate the effectiveness of the proposed three-stage method through numerical experiments in 2D fluorescence lifetime imaging. Peer-Reviewed PaperProceedings of 2016 International Symposium on Information Theory and Its Applications, 2016. This paper concerns time-dependent bioluminescence imaging under low-photon conditions. In this problem, one seeks to reconstruct sources of light contained within a tissue sample from noisy boundary measurements of scattered light. The main challenge in this problem lies in processing signals that are constrained by partial differential equations. In this paper, we propose a novel two-stage method to recover timedependent bioluminescent sources from boundary measurements corrupted by Poisson noise. Numerical experiments demonstrate the effectiveness of the proposed approach. We solve the sparse recovery problem by transforming the objective function into an unconstrained differentiable function and apply a limited-memory trust-region method. Unlike gradient projection-type methods, which uses only the current gradient, our approach uses gradients from previous iterations to obtain a more accurate Hessian approximation. Preliminary numerical experiments with simulated compressive sensing 1D data are provided to illustrate that our proposed approach eliminates spurious solutions more effectively while improving the computational time to converge in comparison to standard approaches. In this paper, we solve the sparse recovery problem by transforming the objective function of this problem into an unconstrained differentiable function and apply a limited-memory trust-region method. Unlike gradient projection-type methods, which uses only the current gradient, our approach uses gradients from previous iterations to obtain a more accurate Hessian approximation. Numerical experiments show that our proposed approach eliminates spurious solutions more effectively while improving the computational time to converge. Peer-Reviewed Paper Accepted to 2017 IEEE International Symposium on Medical Measurements and Applications. Structural variants (SVs) - rearrangements of regions of the genome such as inversions, insertions, deletions and duplications - are present in the genomes of all individuals. Commonly, SVs are detected by comparisons of an (unknown) test genome with a known reference through a sequencing and mapping process. Because humans are diploid (2 of each chromosome), individuals may be heterozygous (1 copy) or homozygous (2 copies) for each variant. If an individual is sequenced at low-coverage it may be difficult to distinguish heterozygous SVs from erroneous mappings. Our approach aims to improve SV detection in three ways. First, our formulation explicitly predicts the number of copies of each potential SV present. Second, we analyze related individuals simultaneously - a parent and a child - and enforce relationships in the copy number of SV predictions when appropriate. Finally, we solve a constrained optimization equation consisting of a negative Poisson log-likelihood objective function with an penalty term to promote sparsity. Despite increasing the complexity of the SV problem formulation by considering copy number, our method decreases the false positive rate despite a large amount of error from both DNA sequencing and mapping. Recent research suggests an overwhelming proportion of humans have genomic structural variants (SVs): rearrangements of regions in the genome such as inversions, insertions, deletions and duplications. The standard approach to detecting SVs in an unknown genome involves sequencing paired-reads from the genome in question, mapping them to a reference genome, and analyzing the resulting configuration of fragments for evidence of rearrangements. Because SVs occur relatively infrequently in the human genome, and erroneous read-mappings may suggest the presence of an SV, approaches to SV detection typically suffer from high false-positive rates. Our approach aims to more accurately distinguish true from false SVs in two ways: First, we solve a constrained optimization equation consisting of a negative Poisson log-likelihood objective function with an additive penalty term that promotes sparsity. Second, we analyze multiple related individuals simultaneously and enforce familial constraints. That is, we require any SVs predicted in children to be present in one of their parents. Our problem formulation decreases the false positive rate despite a large amount of error from both DNA sequencing and mapping. By incorporating additional information, we improve our model formulation and increase the accuracy of SV prediction methods. Peer-Reviewed PaperProceedings of International Conference of the IEEE Engineering in Medicine and Biology Society, 2016. Structural variants (SVs) are rearrangements of DNA sequences such as inversions, deletions, insertions and translocations. The common method for detecting SVs has been to sequence data from a test genome and map it to a reference genome. More recently, DNA sequencing studies may consist of hundreds, or even thousands of individuals, some of which may be related. In order to boost the signal of true SVs, we simultaneously analyze parent-child trios. In order to improve our ability to identify SVs, we boost the true SV signals by simultaneously analyzing parent and child genomes. Our algorithmic formulation SPaRC employs realistic criteria such as sparsity of SVs, relatedness between individuals and variable sequencing coverage throughout the genome. Peer-Reviewed PaperProceedings of 2016 IEEE Workshop on Statistical Signal Processing, 2016. Structural variants (SVs) rearrangements of an individuals' genome are an important source of heterogeneity in human and other mammalian species. Typically, SVs are identified by comparing fragments of DNA from a test genome to a known reference genome, but errors in both the sequencing and the noisy mapping process contribute to high false positive rates. When multiple related individuals are studied, their relatedness offers a constraint to improve the signal of true SVs. We develop a computational method to predict SVs given genomic DNA from a child and both parents. We demonstrate that enforcing relatedness between individuals and constraining our solution with a sparsity-promoting penalty (since SV instances should be rare) results in improved performance. We present results on both simulated genomes as well as two-sequenced parent-child trios from the 1000 Genomes Project. Peer-Reviewed PaperProceedings of 2016 IEEE International Conference on Image Processing, 2016. In photon-limited image reconstruction, the behavior of noise at the detector end is more accurately modeled as a Poisson point process than the common choice of a Gaussian distribution. As such, to recover the original signal more accurately, a penalized negative Poisson log-likelihood function and not a least-squares function is minimized. In many applications, including medical imaging, additional information on the signal of interest is often available. Specifically, its maximum and minimum amplitudes might be known . This paper describes an approach that incorporates this information into a sparse photon-limited recovery method by the inclusion of upper and lower bound constraints. We demonstrate the effectiveness of the proposed approach on two different low-light deblurring examples. Peer-Reviewed PaperProceedings of 2016 IEEE International Conference on Acoustics, Speech and Signal Processing. Recent advances in high-throughput sequencing technologies have led to the collection of vast quantities of genomic data. Structural variants (SVs) rearrangements of the genome larger than one letter such as inversions, insertions, deletions, and duplications are an important source of genetic variation and have been implicated in some genetic diseases. However, inferring SVs from sequencing data has proven to be challenging because true SVs are rare and are prone to low-coverage noise. In this paper, we attempt to mitigate the deleterious effects of low-coverage sequences by following a maximum likelihood approach to SV prediction. Specifically, we model the noise using Poisson statistics and constrain the solution with a sparsity-promoting penalty since SV instances should be rare. In addition, because offspring SVs inherit SVs from their parents, we incorporate familial relationships in the optimization problem formulation to increase the likelihood of detecting true SV occurrences. Numerical results are presented to validate our proposed approach. Critical to accurate reconstruction of sparse signals from low-dimensional low-photon count observations is the solution of nonlinear optimization problems that promote sparse solutions. In this paper, we explore recovering high-resolution sparse signals from low-resolution measurements corrupted by Poisson noise using a gradient based optimization approach with non-convex regularization. In particular, we analyze zero-finding methods for solving the p-norm regularized minimization subproblems arising from a sequential quadratic approach. Numerical results from fluorescence molecular tomography are presented. Peer-Reviewed PaperProceedings of 2015 European Signal Processing Conference. Recent work in -norm regularized sparsity recovery problems (where ) has shown that signals can be recovered with very high accuracy despite the fact that the solution to these nonconvex optimization problems are not necessarily the global minima but are instead potentially local minima. In particular, -norm regularization has been used effectively for signal reconstruction from measurements corrupted by zero-mean additive Gaussian noise. This paper describes a p-th power total variation ( ) regularized optimization approach for image recovery problems in photon-limited settings using iterative reweighting. The proposed method iteratively convexifies a sequence of nonconvex subproblems using a weighted TV approach and is solved using a modification to the FISTA method for TV-based denoising. We explore the effectiveness of the proposed method through numerical experiments in image deblurring. Peer-Reviewed PaperProceedings of 2015 IEEE International Conference on Image Processing. As an emerging near-infrared molecular imaging modality, fluorescence molecular tomography (FMT) has great potential in resolving the molecular and cellular processes in 3D objects through the reconstruction of the injected fluorescence probe concentration. In practice, when a charge-coupled device (CCD) camera is used to obtain FMT measurements, the observations are corrupted by noise which follows a Poisson distribution. To reconstruct the original concentration, the standard least-squares function for data-fitting is not a suitable objective function to minimize since this model assumes measurement noise which follows a Gaussian distribution. Rather, in this paper, we minimize a negative log-likelihood function to more accurately model the CCD camera shot noise. Furthermore, we exploit the presence of the flourescence in only small regions of the 3D object by introducing a nonconvex penalty term that promotes sparsity in the reconstruction. This paper proposes a method to solve the FMT reconstruction problem from low-dimensional and low-mean photon count measurements. Using simulated data, we validate the effectiveness of the proposed non-convex Poisson-based reconstruction method for FMT inverse problems. Peer-Reviewed PaperProceedings of 2015 IEEE International Conference on Acoustics, Speech and Signal Processing. Critical to accurate reconstruction of sparse signals from low-dimensional Poisson observations is the solution of nonlinear optimization problems that promote sparse solutions. Theoretically, non-convex -norm minimization ( ) would lead to more accurate reconstruction than the convex -norm relaxation commonly used in sparse signal recovery. In this paper, we propose an extension to the existing SPIRAL- algorithm based on the Generalized Soft Thersholding (GST) function to better recover signals with mostly nonzero entries from Poisson observations. This approach is based on iteratively minimizing a sequence of separable subproblems of the nonnegatively constrained, -penalized negative Poisson log-likelihood objective function using the GST function. We demonstrate the effectiveness of the proposed method, called SPIRAL- , through numerical experiments. Ph.D. defense talk at UC Merced, Merced, USA on March 24, 2017. IEEE International Confer. on Acoustics, Speech and Signal Processing (ICASSP 2017), New Orleans, USA on March 6, 2017. IEEE Global Conference on Signal and Information Processing (GlobalSIP), Washington, DC, USA on December 8, 2016.
International Symposium on Information Theory and Its Applications (ISITA), Monterey, CA, USA on November 01, 2016. IEEE International Conference on Image Processing (ICIP 2016), Phoenix, Arizona, USA on September 28, 2016.
International Conference on Continuous Optimization (ICCOPT 2016), Tokyo, Japan on August 8, 2016. IEEE International Confer. 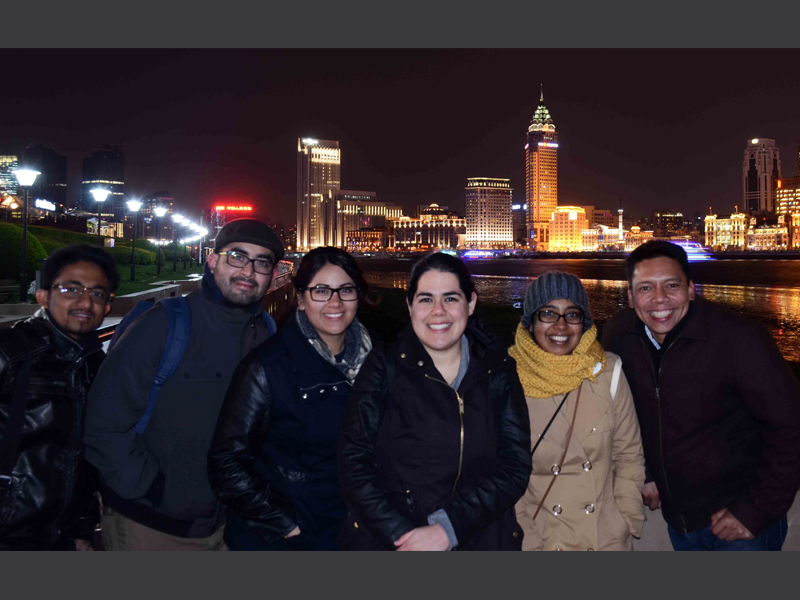 on Acoustics, Speech and Signal Processing (ICASSP 2016), Shanghai, China on March 22, 2016. Applied Math Optimization Seminar at UC Merced, Merced, USA on May 11, 2016. Central Valley SIAM Regional Conference at UC Merced, Merced, USA on April 29, 2016. Applied Math Optimization Seminar at UC Merced, Merced, USA on Nov 16, 2015. 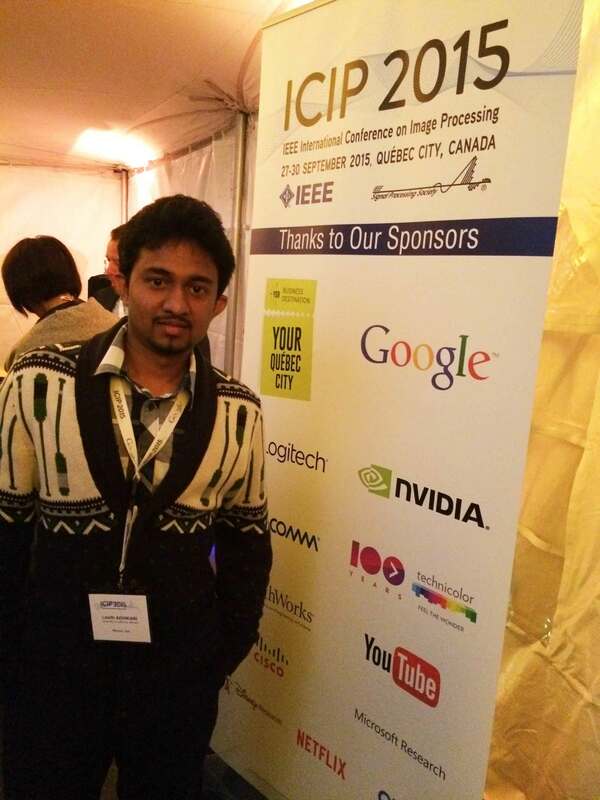 2015 IEEE International Conference on Image Processing (ICIP 2015), Quebec City, Canada on Sep 29, 2015. 3rd European Signal Processing Conference (EUSIPCO 2015), Nice, France on Sep 03, 2015. 22nd International Symposium on Mathematical Programming (ISMP 2015), Pittsburgh, USA on July 16, 2015. Applied Math Optimization Seminar at UC Merced, Merced, USA on Dec 08, 2014. Applied Math Optimization Seminar at UC Merced, Merced, USA on Dec 01, 2014. You can find my teaching experience at University of Sri Jayewardenepura and UC Merced below. Currently, I am not working as a teaching assistant. Teaching Assistant at Department of Applied Mathematics, UC Merced. Math 131: Numerical Analysis I. Math 24: Introduction to Linear Algebra & Differential Equations. Math 140: Mathematical Methods for Optimization. Math 32: Probability and Statistics. An Instructor at Department of Mathematics, University of Sri Jayewardenepura, Sri Lanka. Courses taught : Computer Programming (C++). Visiting lecturer to conduct Mathematics lab session, Faculty of Medical Sciences, University of Sri Jayewardenepura, Sri Lanka. Courses taught : Calculus I/II, Numerical Methods I/II, Abstract Algebra, Optimization I, Applicable Mathematics. At the welcome reception of ICIP 2015 conference in Québec City, Canada. 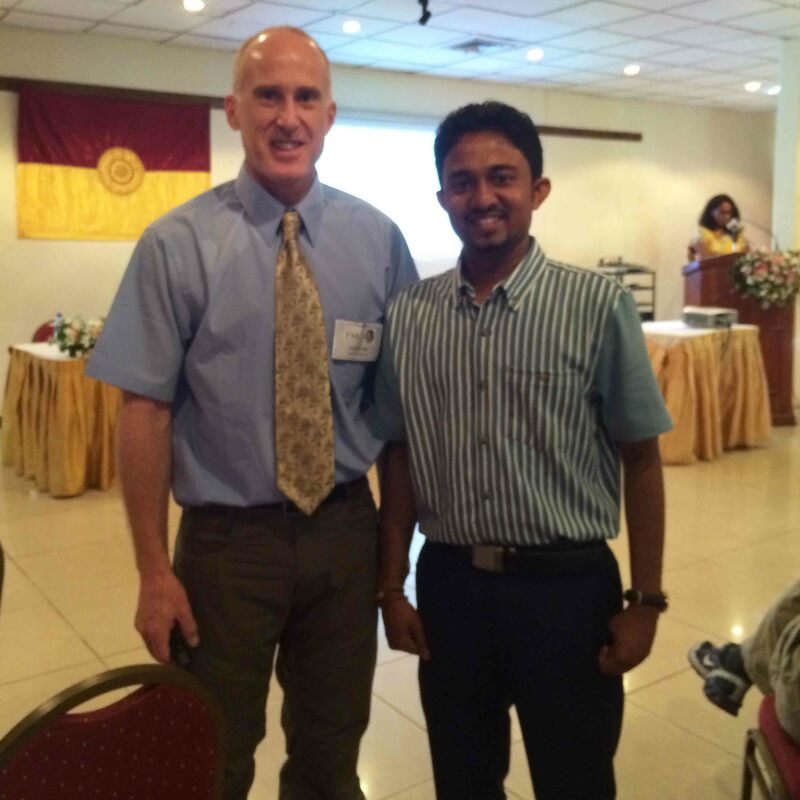 With Prof. James Nagy at the International Industrial Mathematics Conference, Sri Lanka. 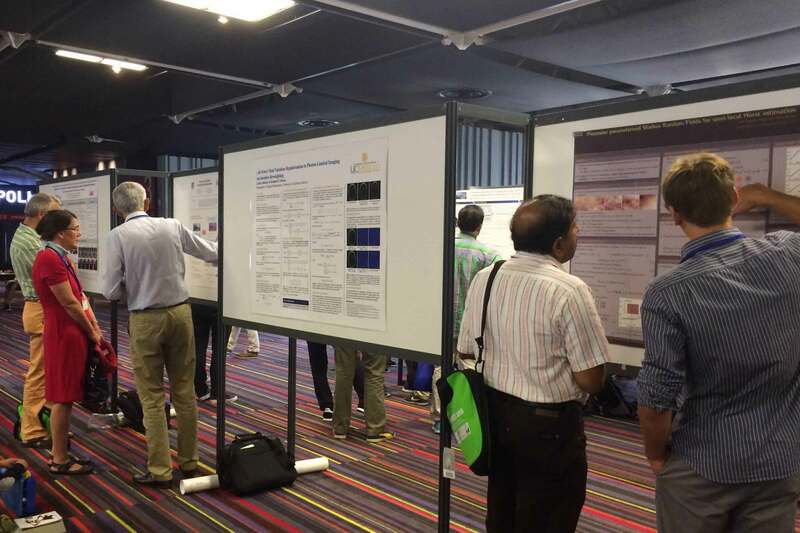 Poster area of the EUSIPCO 2015 conference in Nice, France. 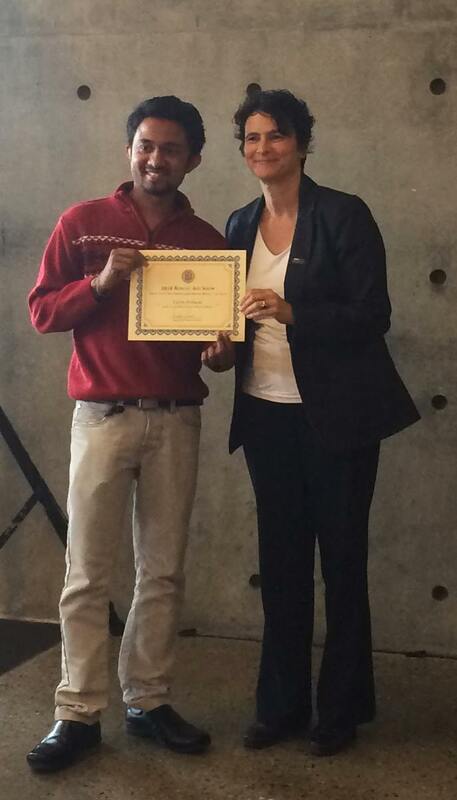 Jill Robbins, dean of the school of social sciences, humanities and arts, UC Merced, awarding the artist of the year - 2nd place award at the 2016 Bobcat art show. With Prof. Roummel at the ICASSP 2016 conference in Shanghai, China. 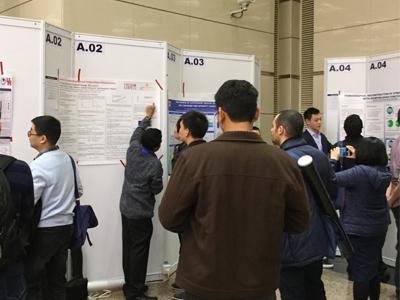 Poster area of the ICASSP 2016 conference in Shanghai, China. I am happy to discuss about my research work and your research work. Any kind of collaborations related to my research interests are welcome. You can find me at my office COB 396-4, which is located at 3rd floor of class room and office bulding at UC Merced.